On 1/1/2017, buyer get a bump to their purchase power when they finance a home loan. The conventional (AKA “conforming”) loan limit increases to $424,100 (from $417K; min 3% down required) and the FHA loan limit increases to $275,665 (from $271,050; min 3.5% down required). In December 2011, the average rate was 4.02%. In the past 5 years, we’re up by 0.17%. The market can fluctuate that much in 1 day (rates move in increments of 0.125%). To give you perspective, in 2009, I paid 6% on a fixed, non-conforming loan when the market was mid-crash and 6.125% on a fixed, non-conforming loan in 2004 as the market gained steam. Note: non-conforming loans (AKA jumbo loans), usually run close to conforming rates and in some cases are lower. We are a LONG way from that at the current average rate of 4.19%. 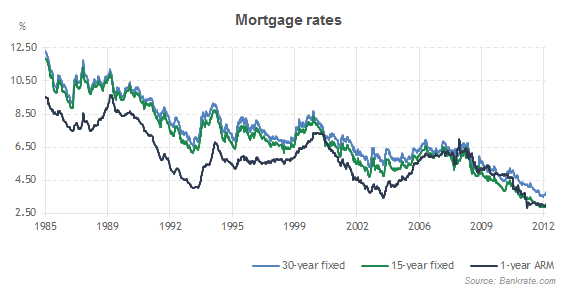 If you’re under the age of 30, ask your parents or someone of that generation what their mortgage interest rate was in the ’80s (if you’re too lazy, add ~10% or more to any of the numbers I quoted; rates were in the teens!). December 17 – With little prospect for a cut in interest rates and the likelihood of further rises, many home buyers could be kicking themselves for not buying in 2016 while they had the chance. As recently as October it was possible to get a 30 year fixed loan at 3.42% according to Freddie Mac’s interest rate survey. Today we are looking at 4.18%. For a $200,000 loan that translates to a payment of principal & interest of $976 per month. In October that same loan would have cost just $889 a month. This is a rise of almost 10% in a matter of weeks. The purchases prices at price points below $300,000 are still moving north at a brisk pace, so a home purchase in 2017 is likely to be a lot more expensive than it would have been in 2016. If interest rates continue to climb, as many are forecasting, it is not impossible we could see 5% reached before the end of 2017. That would make the principal & interest payment for a $200,000 loan rise to $1,270. This is a 43% increase from the payment corresponding to a 3.42% rate, and this could potentially be happening in a little over a year. Millennials are likely to be squealing if this were to happen, and they probably will not take kindly to being reminded by baby boomers that 8% is the long term average rate for a 30-year fixed loan. The monthly payment at 8% is $1,664. Mind you, it was last at 8% in August 2000, so it is easy to forget what it was like. Economists have been predicting interest rate rises for the last 4 years and each year they have been wrong. It appears that 2017 may possibly be the year in which the forecasts finally come true, but no-one knows that for sure, even Janet Yellen. Anyone who thinks rising interest rates cause home prices to fall will discover that is a false premise and has never been borne out by historical example. Home prices depend on supply versus demand. Higher interest rates are likely to cause lenders to be more interested in approving loans and a higher approval rate leads to increased demand. The shortage of construction labor is going to put a lid on additional supply, so unless there is an external change (e.g. a massive population shift) non-luxury home prices in Greater Phoenix are likely to continue rising in 2017, especially for the low end and lower mid-ranges up to $300,000. December 12 – Interest rates have moved higher quickly over the last month, with the most recent Freddie Mac report showing 4.13% for a 30-year fixed. This is 18 basis points higher than this time last year and 20% higher than the 3.44 reading we saw in July and August. Sudden interest rate rises like this tend to increase the sales rate as borrowers try to lock in their existing loan commitments. The sales rate then tends to fall back as the market adjusts to the higher cost of ownership for buyers who were unable to lock in lower rates. We can see that the sales rate was very high for the time of year over the last four weeks, and this is a typical reaction. Listings under contract readings are currently rather weak given the sales rate, again typical of a period just after a significant rise in interest rates. How fast the under contract count rises in 1Q 2017 will very key. This will determine if the positive effect of less stringent loan qualification rules is balancing out the negative impact of higher borrowing costs. Most of what buyers gained by having an increased loan limit is probably going to be wiped out by rising mortgage interest rates. In Maricopa County, AZ, with a median home price in the low-$200Ks, the impact per month isn’t earth-shattering. Nonetheless, buyers need to be aware of how small rate increases do affect their total homeownership cost. Only they can draw the line at affordable & not.